Picturing Disney: RUMOR: Is this Farewell to Rock n Rollercoaster? but has the time finally come to say goodbye? A New York Times article detailing Disney's recent expansion efforts seemed to indicate that Rock n Rollercoaster is being re-themed. 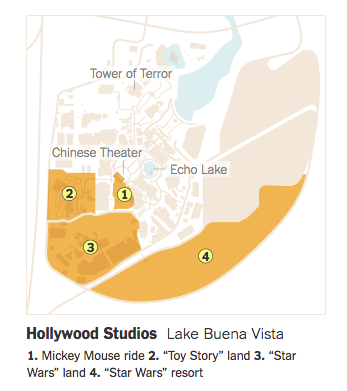 "With its television business facing significant challenges in the streaming age, and lots of popular movie franchises to put to use, Disney is spending billions to supercharge its theme park division, which has emerged as a surprisingly strong moneymaker." You can read the full article --> HERE<-- and judge for yourself. There have been rumors for a while now but the map below pretty much said it all. "Disney insists it has no "current" plans. Make of that what you want." The big question now is will Disney replace Rock n Rollercoaster eventually? We hate to lose an old favorite but we sure do love a new exciting attraction. Its always fun to imagine what's in store for our favorite place on earth! Let's see what happens "Eventually."